Around 2 a.m., on a weeknight in early April 2013, two men hauled $350 worth of reflective plastic bollards down to a block of Cherry Street running under Interstate 5 in downtown Seattle. They got to work as fast as they could. Pull out bollard, attach adhesive, stick to the road, pace out 20 steps, repeat. Ivan Kaplan and his accomplice garnered curious stares from the homeless men and women sleeping under the highway, but in about 10 minutes the job was done. It had all gone smoothly. Still, Kaplan was nervous. Their crime was pretty benign, but illegal is illegal and they were working within sight of the Seattle Police Department’s headquarters. As he stood taking pictures of his work, he heard sirens from a half dozen police cars coming their way. The pair scattered. They left behind a block-long protected bike lane with the bollards serving as a physical barrier between bike and car. A few days later, a Seattle Department of Transportation (SDOT) traffic engineer named Dongho Chang wrote a letter in response to the Reasonably Polite Seattleites thanking them for demonstrating a low-cost safety solution, apologizing for SDOT’s removal of the 36-inch bollards (they were taller than regulation height), and offering to return the bollards if they so desired. He also explained that, because it passed under the highway, that block of Cherry was owned by the Washington State Department of Transportation (WSDOT) and they needed permission from the agency to do anything on the street. It seemed like that was the end of the story for the guerrilla installation, but behind the scenes Chang was working to make the bollards official. He met with his old colleagues from WSDOT to see how they could implement an official protected bike lane on Cherry. Three months after the Reasonably Polite Seattleites snuck out in the dead of night, SDOT narrowed the car travel lane by a foot, installed 24-inch bollards and made the Cherry Street protected bike lane official. They also extended it north another block on 7th Avenue with a two-stage left turn. In responding so positively to DIY activists, Chang propelled himself into the consciousness of Seattle’s bike and ped-loving urbanist crowd and gave them hope that perhaps some SDOT engineers “got it” and might actually bring Seattle’s lagging infrastructure into the 21st century. On a Tuesday afternoon in late March, I found Chang at Fado Irish Pub in downtown Seattle, affable and smiling as always, sitting with T-shirt tucked in shorts, dressed for biking home on an unseasonably sunny day. I joined him over pints — him a Belgian ale, me a venue-appropriate Guinness — to talk about his life as one of the city’s highest-ranking traffic engineers. Chang works primarily on bike, pedestrian and transit projects. He’s been a part of the city’s move to experiment with next-generation infrastructure and with lower-cost pilot projects. 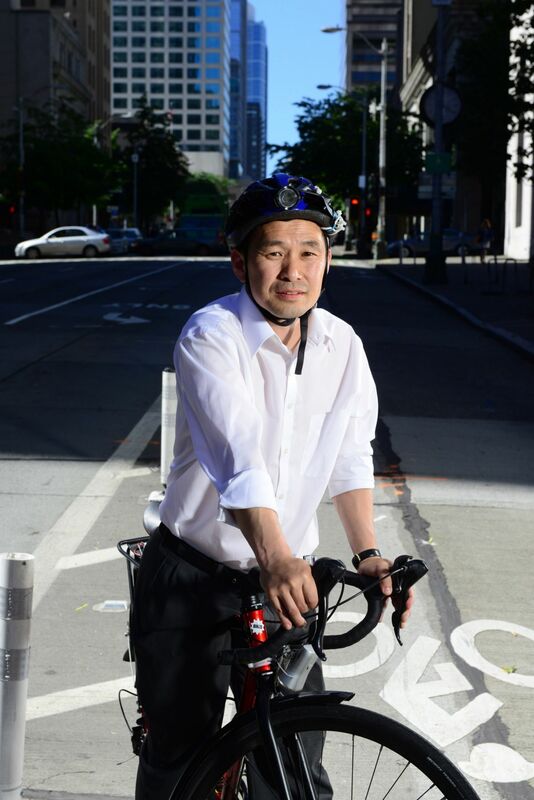 He helped with Seattle’s most prominent protected bike lane on 2nd Avenue downtown, a pilot that was announced and implemented in just five months. He has worked on several major “road diets” that reduced the number of lanes in order to slow down traffic, helped turn four blocks of Bell Street into an experimental green street that prioritizes seating and walking space for pedestrians over car speed, and he’s currently helping design the next stage of Seattle’s forthcoming downtown protected bike lane network. He says his proudest accomplishment to date was converting an unrestricted lane on Aurora Avenue in the city’s Queen Anne neighborhood to a bus-only lane. That willingness to make people angry and not bow to the loudest dissenting voices is rare among bureaucrats trained to run from controversy and seek the path of least resistance with new projects. It’s especially uncommon to see public leadership like Chang’s coming not from a DOT commissioner like Gabe Klein of Washington D.C. and then Chicago, or Mike Bloomberg’s chief of streets, Janette Sadik Khan, but from a rank-and-file engineer. Whether it’s a product of Chang’s character or indicative of the growing institutional and political support for these sorts of projects, it’s helping to slowly change transportation in Seattle. Either way, Chang is frequently the face of bike and ped projects and people have noticed. In the years since the guerrilla bike lane was installed, Chang’s star has risen further with the city’s alt transportation set. It’s odd to talk about the celebrity of a city bureaucrat, but it’s real. Some of it stems from his deep enthusiasm for biking and walking infrastructure. Given 15 minutes, he will inevitably talk about building communities that don’t rely on cars. It makes advocates feel like they’ve got an ally in the agency. Some of it is that Chang is constantly at community meetings presenting about project designs and listening to peoples’ concerns. Chang has also embraced social media as a way to publicize his work. 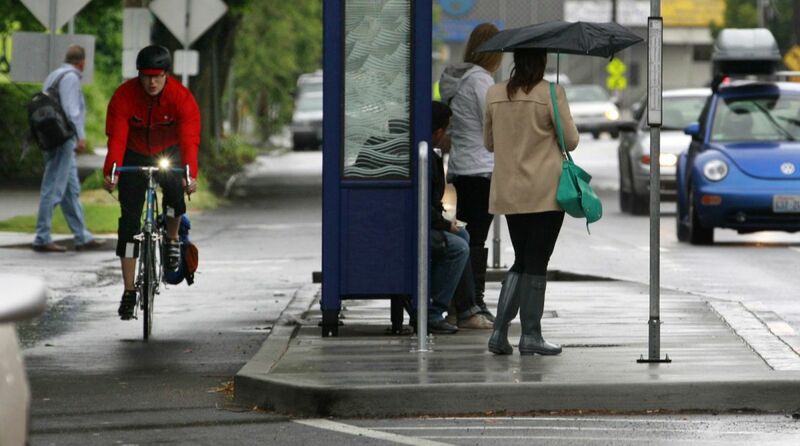 He frequently bikes around Seattle to see how a particular piece of infrastructure is working or not working. During these bikeabouts he tweets pictures and observations about the city: a mailbox library in a neighborhood here, a painted crosswalk there. It shows a man who believes in the power of Jane Jacobs-urbanism to transform communities. He also uses the medium as an open door for complaints and concerns. More often than not, when people point out problem areas in the city, he responds. Though he’s modest about his aims with Twitter, it’s clear he recognizes the power of the tool and has used it to create a personal brand that helps him advance his work. It doesn’t feel like coincidence that the city bureaucrat who’s figured out Twitter is also the bureaucrat who gets recognized with awards and accolades. Seattle Met magazine named Chang one of its “15 People Who Should Really Run Seattle” this year. Chang has spent the entirety of his adult life in the transportation industry. But his path to cult hero was far from a forgone conclusion. For nearly half his career he was in the trenches at WSDOT working to move cars as efficiently as possible. It wasn’t until a mid-career existential crisis about the harm he was doing with his highway engineering, that he decided to seek penance in cities. Chang was born in the large port city of Busan, Korea, in 1968. His father’s sister had married an American G.I., moved to Olympia, Washington, and started helping the rest of her siblings emigrate. Chang and his parents and siblings came in 1977. He says most of what he remembers about his early years in Korea is the poverty and, perhaps looking back through an engineer’s lens, a lack of infrastructure. His parents immediately headed to Alaska to work in the Trident Seafoods canneries. They spent three years working the seasonal jobs and saving money to open their own doughnut shop in Fort Worth, Texas, where they ultimately settled. Chang and his brother KC stayed with relatives in Spanaway, a suburb of Tacoma until they finished high school. He credits a particularly attentive high school counselor, Paul Sevig, for putting him on the path toward engineering. Chang says Sevig recognized his family’s financial situation and helped him apply for schools and scholarship money. Chang decided to go to the University of Washington in Seattle after Sevig drove him up to visit the campus. “I just fell in love with Seattle. I was walking around downtown, and I saw the Seafirst building [Seattle’s tallest skyscraper]. I wanted to be part of this profession that builds the incredible infrastructure that makes society happen. That’s why I went into civil engineering,” said Chang. While he was studying civil engineering at UW, Chang had two influential transportation professors, Fred Mannering and Scott Rutherford. The former believed that a DOT’s primary role was to build roads to accommodate growth and maximize level of service on every street to move the most cars with the greatest efficiency. The latter taught that building roads could only take society so far, that mass transit was critical for sustainable transportation in the long term. Though their philosophies were contradictory, the professors inspired Chang and cemented his desire to work for a DOT. “Those classes helped me understand that transportation is really at the core of how society can grow,” Chang told me. When he graduated in 1991, Chang landed a job in WSDOT’s freeway operations group. The division is in charge of maximizing freeway efficiency without widening roadways, in part by helping drivers make decisions about how to avoid congestion. Now called traffic operations, the group installed roadway detectors and automated software to provide congestion information to traffic reporters in real time and managed on-ramp metering and traffic cameras. After a few years of that, Chang decided he wanted to learn project design and implementation and transferred to a new role as a signal operation engineer focused on traffic lights. As with his previous job, he was tasked with improving the efficiency with which cars were moving down state highways. His specialty was traffic signal timing at rush hour. He would observe problem intersections at rush hour and make tweaks to timing that improved efficiency and safety. It was a never-ending task. No matter the efficiency of a particular intersection, there were always more nearby that suffered from congestion. “I realized I was chasing the same problems over and over again, that there’s a societal ill that I’m not really fixing with these spot improvements,” said Chang. Hoping to give himself the tools to deal with those root problems, Chang returned to UW for a masters in public administration to learn the policy side of transportation work. Degree in hand, he moved from signal operations to a management position in the traffic operations group for Snohomish County, a mostly rural region north of Seattle. It was there that Chang started to lose faith in his work at WSDOT. “The mission was to move goods and cars as efficiently as possible. There was no ability to have influence on land use decisions. I got really, really disillusioned in terms of my role,” he said. Chang realized most of their projects were just helping new car-dependent bedroom communities grow outside of Everett, the county’s largest city, with an endless cycle of reducing congestion and inducing demand. To get there, he knew he needed to learn the ropes at a smaller city DOT. The stars aligned and he got hired at the Everett DOT. He says it was the perfect training ground for city traffic engineering. It has an old, walkable downtown core. It has the state’s oldest transit agency. With just over 100,000 residents, Chang said, “it’s a size where you can listen to community desires, talk to businesses, talk to residents, then respond very quickly.” He spent nearly six years there learning to balance the freight mobility needs of major employers like the port and Boeing with transit expansion and the sort of progressive land use decisions that connected people with parks and schools. “It helped me become much more rounded about my role as a transportation engineer. That experience finally paid off in 2012 when Chang got hired at SDOT. At Fado, I asked Chang how he would feel if he were back at WSDOT. Would he face the same existential questions about the damage his work could do? But as he continued, it became clear that he thinks the agency has evolved in the decade since he left. He points to 2013 when WSDOT became the first DOT in the country to endorse the National Association of City Transportation Officials’ (NACTO) Urban Street Design Guide, largely considered one of the most progressive manuals available. And there’s truth in his defense of WSDOT. Their latest strategic plan highlights goals such as better integration of multimodal planning and greenhouse gas reduction. Secretary of Transportation Lynn Peterson has recognized a “community need for a vibrant, connected and safe environment for biking and walking.” As part of his broad climate plan, Washington Governor Jay Inslee tasked WSDOT with reducing emissions through cleaner cars, cleaner fuels, and moving people and goods more efficiently. It paints a picture of a progressive DOT that’s evolving past the car-first, perpetual-highway-expansion model that’s been standard for the better part of six decades. In practice, however, the agency is still firmly planted in the old model and struggling to fight historical momentum. Andrew Austin, policy director at Seattle-based nonprofit Transportation Choices Coalition, believes WSDOT’s leadership when they say want to change things. But, he said, it takes a lot of time to turn around a 6,000-person agency that literally traces its roots to the Highway Department. Part of that struggle stems from the tight grip the state legislature holds on WSDOT’s budget. As of writing, state representatives are proposing $13.3 billion for new transportation projects. Of that, $8.4 billion is going toward new road construction, $1.7 billion for maintenance and operations, $1.2 billion for transit, bikes and pedestrian projects, and the rest split between ferries, freight rail, stormwater, and everything else. “I think if WSDOT had their say they would want much more non-bonded, ongoing maintenance dollars. But the legislature picks it and it’s political and you don’t get votes generally for maintenance and that’s a problem,” said Austin. The state’s $1.2 billion for transit, bike and pedestrian infrastructure might not seem so bad, but given that transportation accounts for half of the state’s greenhouse gas emissions, building new highway capacity is incongruous with the Governor’s stated environmental goals. Granted, a portion of those emissions is from airplanes, but spending the majority of the transportation budget on new roadway capacity for cars and trucks is no path to reducing environmental impact. Amy Scarton, WSDOT’s assistant secretary of community and economic development, said staff retraining is one of several pieces of their new multimodal strategy. She said the top-down directive everyone’s received is to no longer “assume that a highway problem needs a highway solution.” WSDOT’s planners are now tasked with looking at local roads feeding into the highway system, where there’s existing transit service, and how people are biking and walking in the vicinity. Scarton said there might not be money for highway megaprojects in the long term anyway. In April, I joined Chang for one of his bikeabouts around Seattle. He was showing SDOT’s newly hired Active Transportation Director Nicole Freedman some of the city’s progressive bike and ped infrastructure. We rode up the now-official Cherry Street protected bike lane, along the Broadway two-way protected bike lane, and through the University District to a pilot protected bike lane on Roosevelt Way. It was a nice reminder that Seattle is starting to pick up steam with its implementation of next-generation bike infrastructure. When we reached Campus Parkway on the edge of UW, Chang stopped to share his dream plan for the right-of-way. The street is divided into two sections by a wide, grassy median. Chang explained that neither side of the road is used to capacity, so he likes to imagine shutting down the south side of the median to cars. “People don’t really use the median right now, but if we closed one side to cars, they’d treat it like a park,” he said. It’s clear he believes fully in the power of design to transform streets. Our ride ended at the Burke Gilman’s infamous missing link section, where SDOT has done some work recently to mitigate the dangers of a train track crossing for bicyclists. Chang wandered off to take photos to post on Twitter. While he was gone, Freedman asked me why I’m writing about Chang. I didn’t say it in so many words at the time, but I tried to explain that Chang’s evolution is, in many ways, a microcosm for the evolution that city and state DOTs will need to make in the near future. It’s not a perfect metaphor, but as populations continue to grow, budgets continue to flounder and climate issues compound, DOTs will need to make the same realization that building out endless road capacity is at best a Band-Aid and at worst a propping up of a societal ill.
Freedman agreed and provided an apt summation.